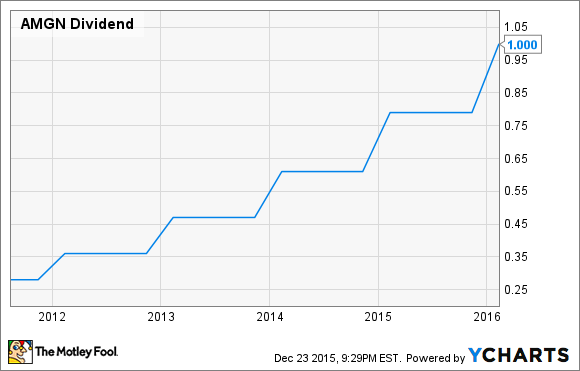 Will Amgen Inc. Raise Its Dividend in 2016? Following dividend increases of 27% to 31% in each of the past five years, can Amgen deliver another dividend boost in 2016? It's been a topsy-turvy year for the original biotech blue-chip stock, Amgen (NASDAQ:AMGN), which currently finds its shares up just over 1% year to date through Dec. 27. You may not realize it based on Amgen's vacillating share price, but it's been a transformative year for the company, with six new drug approvals or label expansions since December 2014. Still, many questions await Amgen in 2016. Will the drug approvals keep coming? Can these drug launches gain traction? And importantly, will Amgen continue to reward investors with a growing dividend? Will Amgen raise its dividend once more? The good news for investors is that we pretty much know the answer to that last question, with Amgen announcing earlier this month that it was giving its shareholders a 27% dividend raise to $1.00 per share, up from the $0.79 per quarter Amgen has paid its shareholders in each of the past four quarters. But can Amgen work its magic once again in December 2016 and offer its shareholders yet another dividend increase? Though nothing is ever cemented in stone in the stock market, I'd suggest you can practically count on it! Amgen's management team has made returning money to shareholders via stock repurchases and dividends one of its priorities, and its rapid dividend growth since first introducing a payout in mid-2011 is a testament to management holding true to its word. In a matter five years, Amgen has raised its dividend by anywhere between 27% and 31% per year. While I wouldn't count on its dividend growth advancing by such a brisk pace in the years to come, the projection of nearly $13 in full-year EPS by 2018 definitely suggests there's more room to run. How will Amgen support a higher payout? I suspect it will do so with its two-pronged approach of cost-cutting and pharmaceutical portfolio expansion. In 2014, Amgen laid off about 4,000 workers, or roughly 20% of its workforce. Normally layoffs like this would signify a company that's in trouble -- but this is far from the case for Amgen. The reason Amgen let go of 20% of its workforce had to do with the expected jump in expenses associated with its plethora of late-stage trials and the subsequent launch and marketing of these drugs. Anticipating a rapid rise in costs over the short term, Amgen undertook these cost cuts to save more than $1 billion annually. Of course, "save" may not be the right word, since this money is merely being redirected into marketing and manufacturing. Amgen is on pace to improve its operating margins from the low to mid 40-percentile to perhaps the low 50-percentile within five years as late-stage trial costs lessen and initial marketing expenses following launches fade. Operating more effectively should allow it more room to raise its dividend. The other factor at work here, and the more important of the two, is the aforementioned expansion of Amgen's product portfolio. The label expansion of multiple myeloma drug Kyprolis into second-line patients, the approval of two cardiovascular products (Corlanor and Repatha), and the approvals of Blincyto for a rare form of acute lymphoblastic leukemia and Imlygic for the treatment of metastatic melanoma, are all reasons to be excited. Additionally, investors can look forward to more robust growth if Amgen's pipeline keeps churning out gems. Of particular interest is the development of nine biosimilars in its pipeline, which could hold the key to hefty sales by the end of the decade, as well as omecamtiv mecarbil as a possible treatment for chronic heart failure. Omecamtiv mecarbil has blockbuster potential if approved. Arguably the biggest question mark for Amgen regarding its long-term growth capabilities is next-generation LDL-cholesterol-lowering injection Repatha. Repatha has the potential for $3 billion-plus in annual sales, but it and its biggest competitor, Praluent, developed by Regeneron Pharmaceuticals (NASDAQ:REGN) and Sanofi (NASDAQ:SNY), also have a dilemma on their hands. The problem with Amgen's Repatha and Regeneron and Sanofi's Praluent has zero to do with efficacy. Both drugs delivered substantially reduced LDL-C levels (the bad type of cholesterol) in clinical studies for patients with select genetic diseases that lead to high LDL-cholesterol, as well as for patients with atherosclerotic cardiovascular disease that aren't achieving the desired results with the use of statins. The issue with both injectable drugs is their price points (for now, at least). Repatha checks in with an annual wholesale cost of $14,100, and Praluent will set patients back $14,600 annually. These costs have made it difficult for Repatha and Praluent to garner significant insurer coverage for the time being, despite both demonstrating major advantages in clinical trials. Amgen and Regeneron/Sanofi both have long-term cardiovascular outcome studies under way that will ultimately determine the value of Repatha and Praluent. If these drugs wind up reducing the risk of a cardiovascular event, or even reducing the potential for death, then insurers may have no choice but to accept Repatha's and Praluent's price points. If these studies don't outperform the current standards of care, PCSK9 developers may need to cut their prices. For Amgen, if Repatha hits the mark in its long-term cardiovascular outcomes study, look for its dividend growth to be rock-solid for the remainder of the decade. Currently yielding 2.45% based on its new $1 per quarter payout, Amgen is a stock that income and growth investors can now consider for their investment and retirement portfolios. Well beyond its stagnant growth stage of last decade, Amgen looks to me to be a company you can trust for modest share price appreciation over the long run.